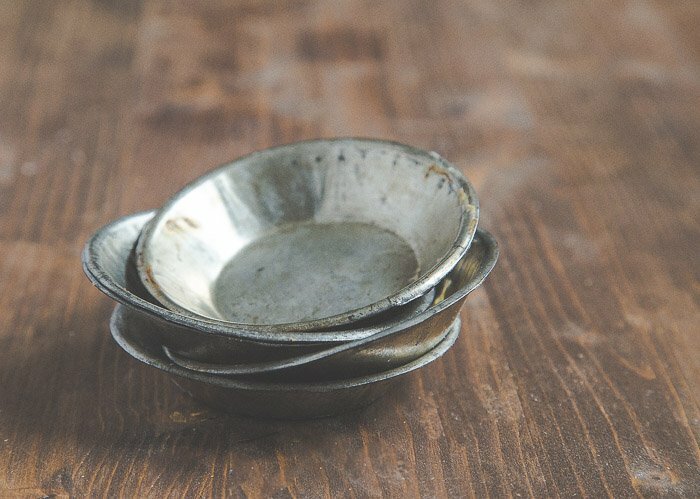 Have you ever seen these vintage mini metal pie pans? They’re about 4″ wide and only 3/4″ inch deep or so. I think I’ve seen them at almost every estate sale and thrift store I’ve ever been to. At some point, back in the day, mini desserts were very chic. And suddenly I feel like I missed my calling. In a world that wants outrageous desserts crammed with as many flavors as possible (and laden with as many processed calories as possible), my petite desserts are crumbs. I’m just making mini pies today. With one nectarine. It seems small. It seems like a lot of effort for two mini pies. But, they’re special little pies because they’re flecked with vanilla bean. If a sparkling crust isn’t pretty enough, a pinky-peach pie filling with black specks will win the beauty pageant. I tried to keep it as simple as possible—you don’t even have to peel the nectarines. The thin nectarine skin melts in the oven. They’re also responsible for the pink hue. I love the skins because I think they add a bit of tartness. However, don’t forget the lemon for tartness. I made these once without lemon, and they tasted flat. As I’ve learned with juicing, lemon is important for flavor in fruit desserts. If you want to bake 4 mini pies instead of just 2, I’ll include instructions in the recipe below. From there, you can triple the recipe (or quadruple,or whatever-your-little-heart-desires). If you haven’t scooped up a few of these vintage mini pans before, you can make this recipe in muffin cups. You will get a few more pies out of it that way. I think you’ll know what to do with the leftovers. I know a puppy who might like them. In a small bowl, combine the flour,2 teaspoons sugar and salt. Dice the cold butter and add it to the bowl. Work the butter into the flour mixture using your finger tips or a pastry blender. The butter should be evenly distributed throughout the flour and smaller than peas. Take your time, it takes a few minutes. Next, add the apple cider vinegar to 3 tablespoons of water, and add this to the flour mixture. Stir with a fork until a shaggy dough forms. If the dough seems dry and won't clump together in your hand when squeezed, add the remaining tablespoon of water. Form the dough into a 5" disk, flatten, and wrap in plastic. Chill for 30 minutes. Meanwhile, dice the nectarine (leave the skin on). Place the nectarine in a bowl with 3 tablespoons of sugar, cornstarch and lemon juice. Stir very well. Set aside to let the juices develop. Remove the dough from the fridge, and roll out on a floured surface. Roll it wide enough to have room for 4 pies (even though you are only making 2--you need a bottom and top crust). Cut out two bottom crusts and two top crusts about 1" larger the the pans.. Drape the bottom crusts in the two pie pans. Stir the nectarines, and then add the vanilla bean. Enough juices should have been released to let the vanilla bean evenly distribute throughout the mixture. Divide the nectarine mixture between the two bottom crusts. Add the top crusts, and pinch together. Brush each pie with egg yolk, sprinkle with sanding sugar, and place on a small baking sheet. Bake for for 30 minutes, or until nicely browned. Let cool for at least 1 hour before serving. I love those little tins, I don’t think they were really ever a thing in the UK. These pies look absolutely gorgeous. So pretty. Nectarines are a favorite. And everything is cuter and tastes better in mini form. At least that’s my sister’s and my opinion! THESE PHOTOS. THESE PIE. I LOVE THEM. I WANT THEM. Pinning them! 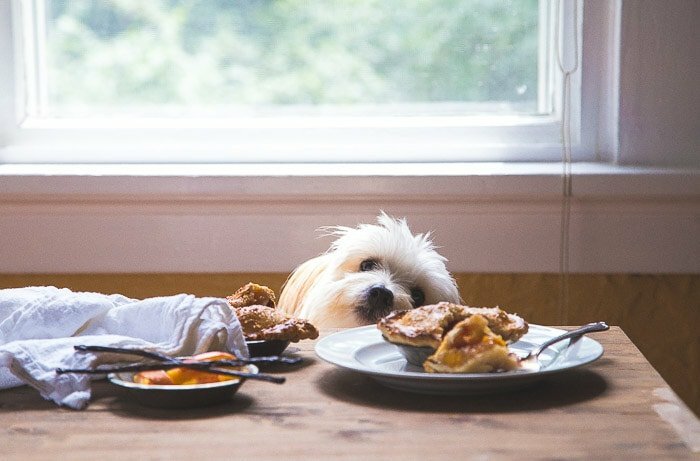 That last pic with your little puppy makes these pies even more delicious and drool worthy!! Oooohhhh these are so cute! And totally delicious looking. Love! ok, now we’re all heading out to look for those vintage mini metal pie pans! love these! 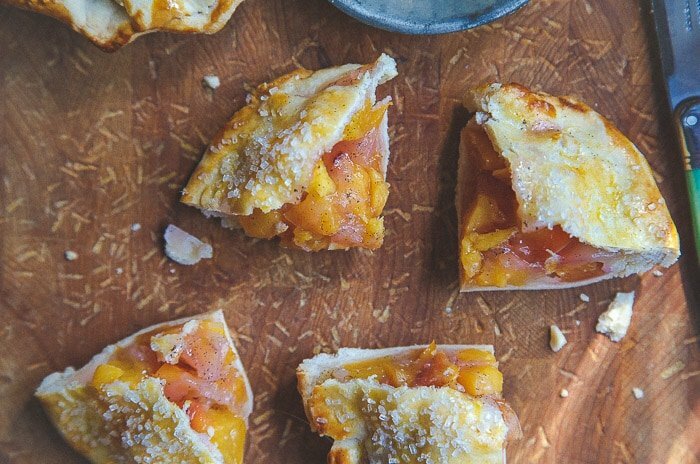 and love these nectarine vanilla bean pies! Those vintage pie plates have me swooning. I love this, I have never had a nectarine, but I will be now! These are adorable and so is your pup!!! Those little tins are so adorable! And I think you’re right, I’ve never been to an estate sale where I didn’t see a couple of them there. So cute! And please please please give me your simple, beautiful + yummy desserts over all the mile-long-name stuff any day! I’m a nectarine fiend! It’s always sad to me that nectarines are glossed over in favor of the more popular peach. Nectarine pie is where it’s at! And I’m so glad I’m not the only one who skips peeling. It always seemed pointless to me. I need those pie those tiny pie tins so hard!!!! WHY have I never seen them? :( I always end up getting the store-bought graham cracker mini crusts. I would love some REAL mini tins!!! I’m in love with these pies too. Vanilla is my drug. That last photo is killing me! I have to be very careful when setting up for shoots – if I leave the office door open and turn my back, the pup will try to snag some for himself! Love nectarines. Love pie. Love this recipe! Definitely trying it soon! I’m feeling a little left out because I have definitely never seen those adorable mini vintage pie pans, ever. You’ll find me scouring all of Austin’s estate sales and thrift stores for the next 17 weekends until I find them. I can’t get over how cute they are! Also, LOVE that you left the skins on for this recipe – the color that they add is gorgeous and I’m all about a little tart in my sweet! I want to reach through my screen and eat every last one! Simplicity is best. Thank you for not peeling the nectarine, it’s a pain doing that anyways. Love everything about these beauties! These look perfect! And that photo of the end…..too adorable! I can’t even deal! These cute pies look delicious with their golden sugar crusted pastry! So delicious! These sound like little bites of heaven! Everything about this post is perfection!! What an adorable puppy pic. And these mini pies are probably the most gorgeous thing I’ve seen all day! 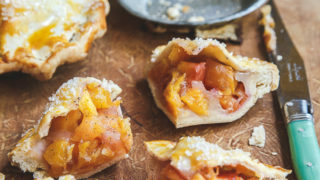 These mini pies look SO delicious.. loving the combination of nectarine and vanilla together. I need to recreate this recipe.. Pinned! I want the back in the day chic mini desserts to return because these are just incredible! The vanilla bean is everything. These are SO cute. And I love how easy they are. I’m not a huge fan of having to peel peaches or tomatoes or really any fruit or veggie unless it’s absolutely necessary. I love the vintage mini pie pans! I’ll need to check out some local antique stores to find some cute bakeware like that! I don’t remember seeing pie pans that small before. How cute and you don’t have to fight to get the first slice out of the pan! Love it! And how cute is that pup begging over the top of the table?!?!? Love the simplicity of these pies! Totally loving the tiny pie tins and these pies! 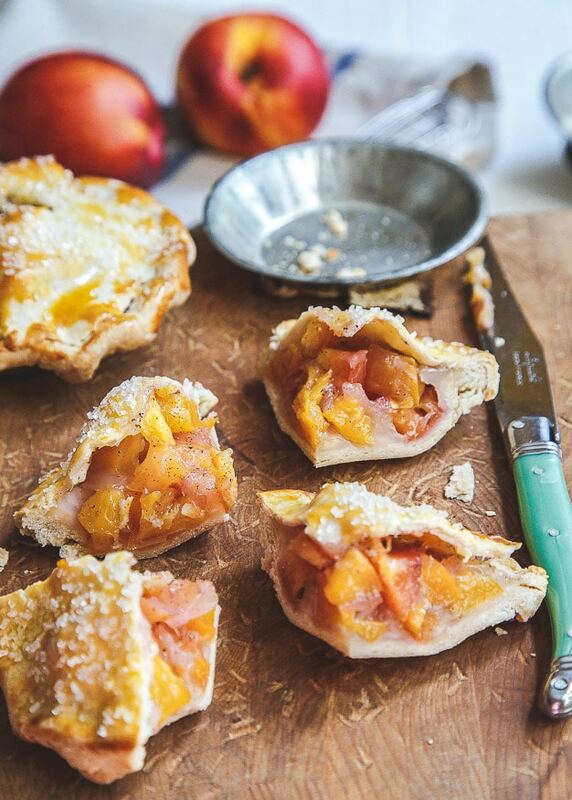 I adore nectarines and so the idea of these beautiful little pies, heavy with vanilla is pretty much heaven to me. I bought little pie pans like that 2 summers ago and they were the best investment ever! Pie all summer, chicken pot pie all winter. They are just too fun! Love the pictures lady… looking good! I have fond memories of my grandma serving up individual pies and apple dumplings in little glass Pyrex pie pans which I now own! They are a bit larger than the ones you show, just enough for both my husband and I to share a dessert of many of your fab recipes now that our children are grown. We love anything peach and I’ll will be making this next with the sub. of some wonderful MI peaches! Hi….I’ve been wanting a recipe for mini pies for a long time!! Do you ever quadruple the recipe? I can’t wait to try it!! I love, love your site! and because of you, I have had mini pie pans on my wish list for a while. Well I finally got them last week and although I am on the cusp of supermarket nectarines….. I’m pretty sure these are making an appearance in the next week at my house… oh my. Precious little pies! I’ve found some tins online. And Sur La Table also has them.